One thing about having 1 million customers is that sometimes, they can get lost. Especially after their Network crashes as noted in FLOW Jamaica Network Outage due to 1 Million Satisfied Customers. Finding a FLOW Store may require that you find your location on Google Maps and then see if you know a Store nearby. But if you have no access to Free Wi-Fi or a Data Plan, then locating a store using Google isn’t gonna work. Fortunately, you can simply text the name of you parish to 4636. 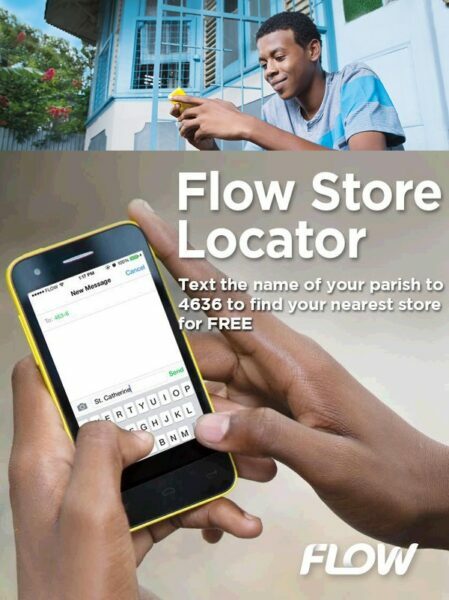 The service will send you a Text message with the name and the address of the FLOW Store closest to you. This FLOW Tip is excellent; now if only FLOW could integrate into the My FLOW App and make the My FLOW App work without the need for Mobile Internet, then I wouldn’t have to memorize another USSD code for such an essential service. Still, at least this means that texting is back in style and I don’t have to call 114 and be charged money I don’t have or resort to borrowing using FLOW Lend as I’d advised in FLOW Jamaica launches FLOW Lend so you can borrow Voucher Credit. Sharing is caring so share this article with your friends, encouraging them to switch to FLOW Jamaica!